Karur District Court Recruitment 2017-2018, 04 Junior Administrative Assistant, Junior Administrative Assistants (Computer Operator), Office Assistant Posts Apply Online (www.ecourts.gov.in/tn/Karur). Karur District Court Junior Administrative Assistant Jobs Notification 2017 Released. 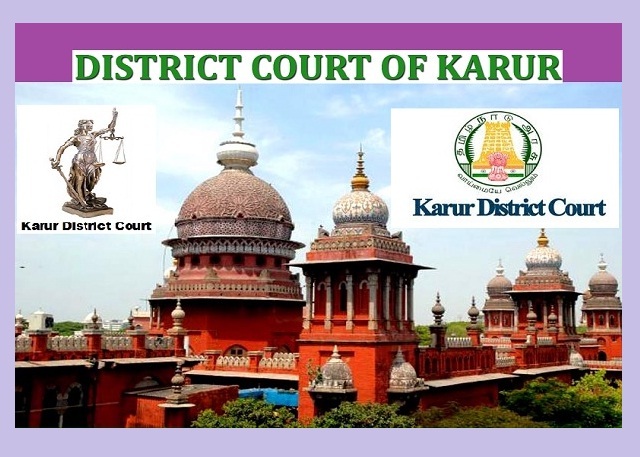 Karur District Court pattern of examination, Karur District Court Syllabus, Karur District Court Question Paper, Karur District Court Admit Date Release Date, Karur District Court Exam Date, Karur District Court Result Date Scroll Down. Karur District Court Recruitment 2017-OA, JAA Posts - Apply Online. Junior Administrative Assistant - Pass in l0+2 / HSC. Junior Administrative Assistants (Computer Operator) - Pass in l0+2 / HSC & Certificate Course in Computer on Office Automation /Diploma in Computer Application. Office Assistant - Pass in VIIIth Standard. Preference Will be given to the persons having Valid I-MV driving License. Filled Application to be Sent to the Following Address: "The Chairman / Principal District Judge, District Legal Services Authority, Combined Court Building, Thanthonimalai, Karur - 639 007."